Reproduced from King's Views of the New York Stock Exchange(1897) and Valentine's Manual of Old New York, 1922, p. 185. These early photographs show Wall Street in the 1860s. 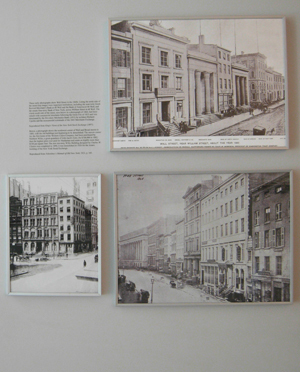 Lining the north side of the street (top image) were important institutions, including the near-twin Greek Revival Merchant's Bank at 40 Wall and the Bank of America at 44 Wall, and the ornate four-story Bank of New York, across William Street at 48 Wall. [Click here to see the progression of the block from 30 and 40 Wall Street east to William Street.] 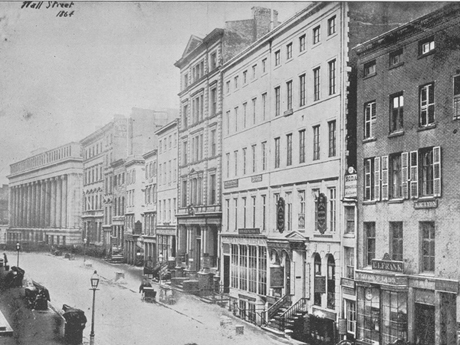 The whole south side of the street, seen below in a photograph of 1864, had been rebuilt with commercial structures following the Great Fire of 1835 and was dominated by the five-story Mechanics Bank (1855) by architect Richard Upjohn and the monumental colonnade of the 1842 Merchants Exchange. Below, a photograph shows the southwest corner of Wall and Broad streets in 1885, with the old buildings just beginning to be demolished. The narrow corner lot, the first home of the Western Union Company, had been purchased by Matthew Wilks, a great-grandson of John Jacob Astor, for $168,000 in 1882, then the highest price ever paid for Manhattan real estate at slightly more than $330 per square foot. The new ten-story Wilks Building designed by Charles W. Clinton was completed in 1890; it was demolished in 1920 for the Annex building of the New York Stock Exchange. Wall St. south side around 1864, pg. 81, King's Views of NYSE 1897-1898.